YORBA LINDA, CA (March 1, 2011) —Minutes after Robert Hight and his Jimmy Prock tuned Auto Club Ford Mustang raced to a season opening win at the 51st annual Kragen O’Reilly NHRA Winternationals Hight was giving some of the credit to a lucky charm he picked up from a fellow Ford teammate last season. In honor of the Wood Brothers dominating performance at the Daytona 500 Hight raced all day with a commemorative coin Eddie and Len Wood gave him at Charlotte’s zMax Dragway in 2010. For Hight the win was a reversal of misfortune when you look at how he finished the 2010 season. 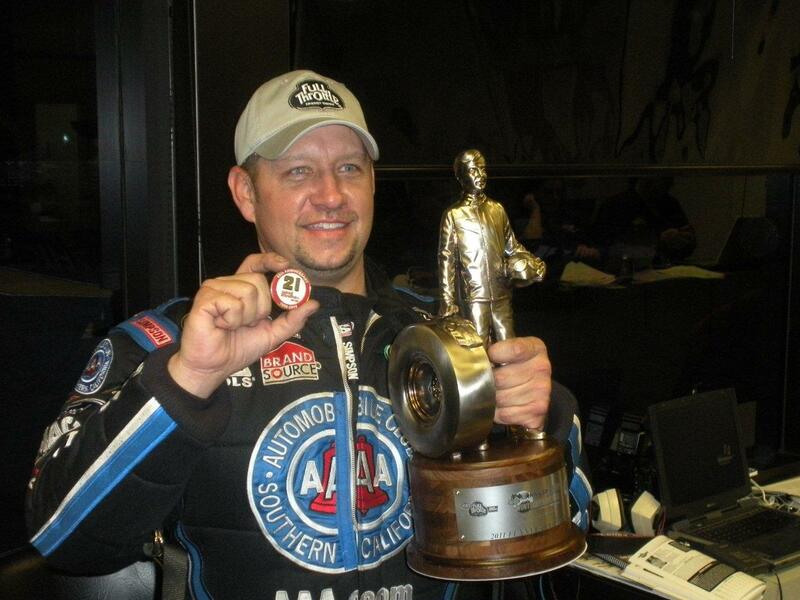 His last round win came in August at the Lucas Oil NHRA Nationals in Brainerd, Minnesota and the 2009 Funny Car champion went 0-5 in the Countdown after starting in the No. 2 position last season. Through all the adversity Hight and his Auto Club Ford Mustang team never gave up. Hight along with 15-time Full Throttle Funny Car champion John Force and up and coming Funny Car driver Courtney Force will attend the Kobalt Tools 400 NASCAR race this weekend at Las Vegas Motor Speedway. It will be a celebration of both Ford victories as well as the first event an early version of the John Force Racing Road Show will be unveiled. 42nd annual NHRA Gatornationals, March 10-13, Gainesville, Fla.
12th annual SummitRacing.com Nationals, April 1-3, Las Vegas, Nev.
2nd annual NHRA 4-Wide Nationals, April 15-17, Charlotte, N.C.
31st annual Summit Southern Nationals, May 13-15, Atlanta, Ga.
23rd annual O’Reilly Summer Nationals, May 20-22, Topeka, Kan.